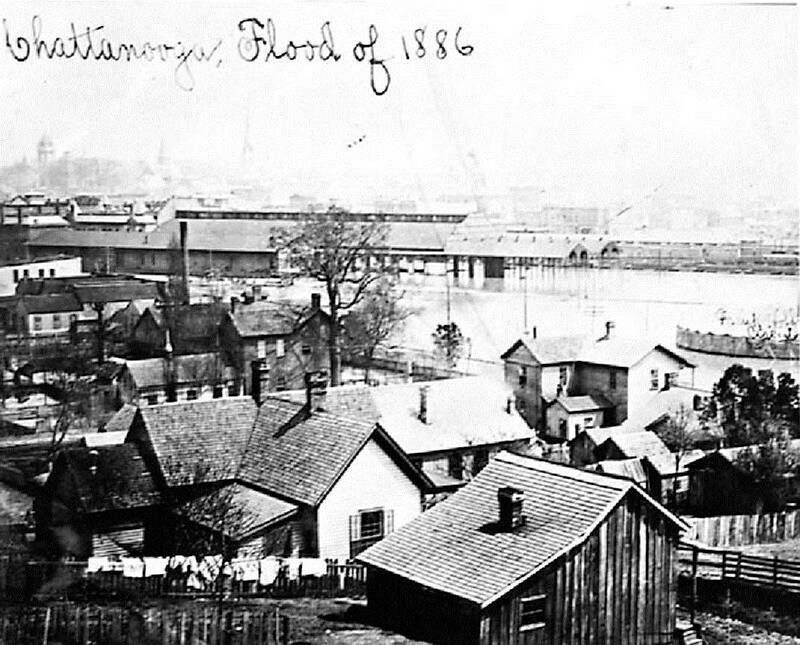 Chattanooga Public Library archives Looking southwest from Cameron Hill during the 1886 flood. Several of Hamilton County's older residents remember the flood that occurred in 1973. Three days of heavy rain in March that year resulted in flooding that closed Lovell Field and more than 200 streets. Much of East Ridge, the area near Hixson High School, Brainerd Village and Eastgate Mall were all inundated. In Soddy-Daisy, the large light poles on the softball fields being built across from the lake lazily floated back and forth in the outfield. Waters rose to a flood level of 37 feet, which without TVA's system of dams and reservoirs was estimated to have been 52.4 feet. But 1973 was not Chattanooga's worst flood. In March 1867, a winter of heavy snowfall combined with melting snow from a late February thaw in the mountains started filling streams and saturating the ground. Heavy rain fell for several days the first week of March. Streams that fed the Tennessee River above Knoxville began to overflow and proceeded down the river system. First Knoxville, then Loudon, suffered great damage from the rising waters. The 5,000 residents of Chattanooga remained blissfully ignorant of the deluge heading their way. Even though there were telegraph connections to Knoxville, they were primarily for use by the railroads. A rude awakening literally occurred. On Friday night, March 8, guests at the Crutchfield House, the predecessor to the Read House, awoke near midnight to find five feet of water in the hotel lobby. By the next night, there was five to eight feet of water on the streets, and the water was rising. Residents took to their rooftops and had to be rescued by boat. The water continued to rise until Monday morning, March 11, when it was at 58.6 feet, the highest ever recorded. The iconic photograph published with this article shows a view of Chattanooga from Cameron Hill. Only the smokestacks of locomotives in the depot yard could be seen, and the water was five feet deep at the Union Depot across from the Crutchfield House. Steamboats actually came up Market Street as far as Fifth Street and could have gone further. The flood waters traveled down the Tennessee River, causing inundation and damage all the way to the Ohio River. In Chattanooga, no lives were lost, but merchants lost stock and inventory. Houses, barns and outbuildings were either destroyed or carried off their foundations to new locations. Freight at the depot was lost along with damage to the rolling stock and tracks. The military bridge built by the Union army that connected Market Street with the north shore was washed away, except for one section. Its piers remained, however, for almost 50 years, until they were dynamited to make way for the current Market Street Bridge. Travel across the river was by ferry boat until the Walnut Street Bridge opened in 1891. Chattanooga is susceptible to floods, as a large basin collects water that combines into the Tennessee River above Knoxville, joins with the streams (such as the Hiwassee River) that flow into it below that point, forming an almost fan-shaped collection area. Then, immediately below the city, the river flows through the Tennessee River gorge, which contributes to water backing up toward the city. Floods are known to have occurred 17 times between 1791 and 1936. More recently, there have been floods of more than 30 feet five times since the 1973 event, the most significant of recent memory in May 2003. Sam D. Elliott, of the law firm of Gearhiser, Peters, Elliott and Cannon, is the author or editor of several books and articles on Tennessee in the Civil War era, including a forthcoming biography of Gov. John C. Brown. For more, visit Chattahistoricalassoc.org.